Introduced in back-up stories from the recent Young Animal and DC crossover Milk Wars, Eternity Girl is an interesting and exciting new book in phase two of the Young Animal imprint. Created by GLAAD and Eisner award nominee Magdalene Visaggio and Sonny Liew, who also handle the script and pencils and inks, respectively, along with Chris Chuckry on colors, this team has created a quirky and very personal series. Young Animal, which was developed in collaboration with Gerard Way of My Chemical Romance fame, has shown a knack for unconventional titles like Mother Panic, Bug: The Adventures of Forager, Doom Patrol and the crossover Milk Wars. The entire line has addressed a number of social and mental health issues such as depression and anxiety, aimed at a mature audience. Vertigo rose to prominence in the late 80s and early 90s as the book for mature readers. Young Animal has shown that books for mature audiences can still tell a relevant and often heartfelt story without being bogged down with gore, violence and obscenities. Eternity Girl takes a refreshing look at psychological issues and how individuals involved in the superhuman community deal with them. While this has built intrigue, readers starting with Eternity Girl #1 may have missed on some crucial backstory that is only hinted at in this issue if they didn’t read Milk Wars. Writer Magdalene Visaggio opens new doors as to how a superhero can be perceived. Main character Caroline Sharp is a former spy and superhero that worked under the name Chrysalis. Caroline was horribly disfigured and gifted with elemental powers while battling her enemy, Madame Atom. This book opens with Caroline talking to her therapist, while panels in the background show her jumping off of a bridge and attempting suicide. Turns out that it never works for her. This is a massive way to open a series and introduce a character. Caroline’s severe depression is an integral part of this issue and seems like it will be through the series. Visaggio is fantastic highlighting Caroline’s mental illness, as well as the struggle she has controlling her powers. Mental health has been a critical social topic lately, hopefully through thoughtful writing like what Visaggio has displayed, more eyes can be opened and discussions had. Sonny Liew has employed an art style that seems to be the norm with Young Animal books, a funky pop style that often uses some psychedelic nods to envelop the reader in a whole different world. Anyone who is familiar with other Young Animal books will feel at home, though it can feel a bit jarring for a first-timer. Not that it’s a bad thing, because it’s beautiful artwork, just distinct. However if you can take anything away from this book, it’s that different can be a blessing and a curse. Chris Chuckry’s colors bring this title to another level. Caroline is surrounded by what appears to be a blue aura, giving her a very ethereal look and feel. Coupled with her severe depression, it makes her stand out that much more. The reader is also treated to some panels with Caroline in out-of-body experiences that have some incredible background art that will hopefully be seen more in future issues. 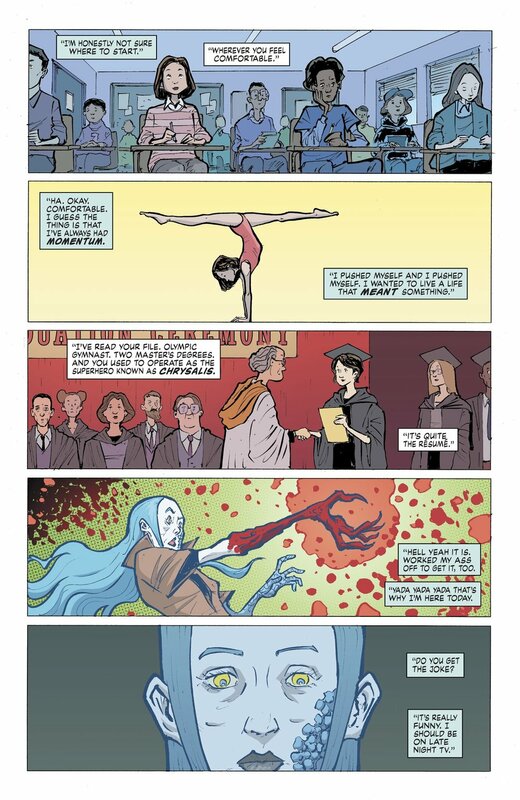 Eternity Girl is a book that delves very heavily into the human psyche and an incredibly powerful individual dealing with severe depression and an existential crisis. This isn’t a book that you can plow right through, you need to take your time with it. The topics discussed in this issue, and more than likely this series, need to be discussed in the open without shame or embarrassment, and hopefully this series can do that while telling the tale of this tragic, yet exciting new character.